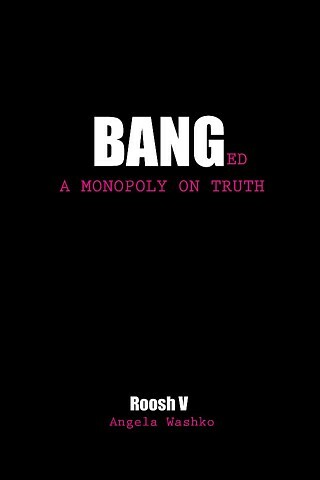 BANGed: A Monopoly on Truth is a book based on seven months of exchanges between feminist artist Angela Washko and the "internet's most infamous misogynist" (a pick-up artist, author, blogger and notorious manosphere leader). The book contains chronologically ordered essays and interviews by Washko about the project, the entire transcript from her interview with the pick-up artist himself, and serves as a timeline for BANGED. BANGED was a project initially proposed as a platform in which the artist would interview women who have had sexual encounters with this pick-up artist (a former industrial microbiologist who now writes textbooks called BANG, Day Bang, Bang Iceland and more about “picking up girls and getting laid” across geographic and cultural boundaries) and produce a parallel book and web-based project to his conquest narratives. Angela Washko intended to distribute calls for these women through mainstream media, Craigslist, physical posting and more. This project became problematized when the pick-up artist himself became aware of it. At that point the artist realized the project would from then on have exist in conversation with him. The book tells this story from the perspective of the artist and serves as a testament to our contemporary condition of increasingly disparate bubbles that exist online and elsewhere - creating their own vernaculars and developing radically different ways of viewing the world. It is also a document analyzing reactions to Washko's experience shifting from activism to ethnography in spaces of extreme hostility toward women and feminists. The book is 103 pages long and comes with a signature and handwritten edition number. It is an edition of 300. This book should be purchased in conjunction with On Public Opinion: Responses to BANGed, an experimental book which chronicles public commentary on the project and offers perspectives from radically polarized communities.